I drew the winner this morning Susie K -- and she has been notified. I do need to do a newsletter which will have another giveaway and I will be visiting a number of blogs in the coming weeks, plus there is the Goodreads giveaway so there are more chances to win a signed copy BEFORE His Unsuitable Viscountess is officially published. If you can't wait, both Harlequin.com and Millsandboon.co.uk will be selling print and ebook copies starting on 1 July. The kindle and Nook versions won't be availabe until 1 August. We had a tremendous thunder storm yesterday afternoon. The Tyne Bridge got hit by lightening. Search -- youtube lightening strike tyne bridge as several people captured the dramatic incident. The A69 was closed for a time. Hopefully the rain will stop soon. My youngest long await Buckfast bee colony will now not be delivered until the 10th as the weather has been too extreme and the colonies are not building the way they want them too. Yesterday my sister went to the Mall in Washington DC to see if she could find my brother's panel. My brother died of AIDS in 1992 (hard to believe it has been nearly 20 years). He was 30. AIDS was not a fashionable illness then, anything but. People I knew told me that I would never have to speak of him and that I shouldn't tell my children about him. (I declined to take their advice btw) It was before various celebrities became involved and started championing it. It was before Tom Hanks was in Philadelaphia.Before Freddie Mercury died. Before many things. Eric was the first person really to listen to my stories and always knew that I would become a writer. He believed in my ability long before I had the courage to write my stories down. I don't speak about him often as it is an old wound and private. Like any relationship, we had ups and downs but he was my older brother and I loved him. Besides they don't tattoo things like that on your forehead and I hated seeing pity in people's eyes or having to explain or... Plus I know he would want me to live my life to the full and in order to do that you do have to put your past behind you. You have to live in the moment. I have not seen the panel as it was done by friends of my brother. My mother adores sewing. It is something she has always done but she felt these friends needed to make the panel more.She knew that my sister, her and me would carry Eric in our hearts. (My father died shortly before my brother found out he was ill). My brother's panel is not out on the Mall but will be displayed somewhere in Washington later this summer. The quilt is way too big to be displayed all in one place any more. The last time was 1996. I know my sister will find it and honour our brother. My sister was interviewed about the quilt by National Public Radio for All Things Considered. When I listened, I started crying. You can listen here. It takes a couple of minutes. I am very pleased and proud that my sister consented to be interviewed. It is good that there is a quilt and people can look at it and see the toll and very real human cost of this disease. They can also see that people who died of this terrible disease were more than just names but living beings with interests and families and friends who loved them. If you happen to see the AIDS quilt panel 3602, that is my brother Eric Phifer's -- just know that he was loved. He had huge potential and it was very much a life cut short. Which is all you can really say about most of the victims of AIDS. 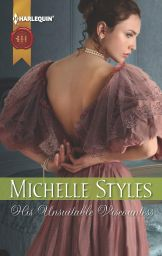 I am also giving away 5 copies of His Unsuitable viscountess through Goodreads. My authors copies have just arrived! All entries will go forward to the Grand prize draw of a Kindle fire (or top Kindle in your country). The grand prize draw takes place on 29 June and the winner of my Taste of a Northumbrian Summer will be drawn then as well. Laura C asked a question in the comments about what happens when the heroine is the protagonist and hero rather than operating as a co-protagonists operates as a major secondary. Does he have to have a character arc? I would argue that if two characters are involved in a life changing romance, both of them had best change. If the hero is acting as a major secondary, he might not have as dramatic curve but he will have a character arc. If he can successfully take part in the final climatic scene at the end of the story as the same person he was at the beginning, you don't have a story. Any time you are involved in an emotional relationship, you are changed in some fashion. Perfection in a character is boring. Imperfection makes more interesting characters. What is your secondary's flaw? What are his fears? Why can't he be with the heroine at the start? What lesson is he going to learn from her? How are you goign to show that he has learnt the lesson and is worthy of the changed heroine's love? If you look at Romancing the Stone, Jack does change through out the story. He wants to become a better man. He doesn't steal the map from Joan. He is no longer involved simply for the money. He is not the main POV character but he does change and he does decide to invite Joan onto his yacht or rather to share the adventure of his life. He needs her in his life. Joan has changed the most but Jack has also changed. If you look at Casablanca, Rick changes the most but Ilsa also changes. They both in their own ways put Paris from them and then have been able to recapture that. The amount of change a character has to go through depends on the character. the protagonist of a story should always go through the most change, but if it is a romance which forms the spine of the story, then both characters should change. Or otherwise what is preventing the non changing character from having his or her HEA? The change can be small. It may be that the character learns they need the protagonist in their life to be complete bu they should change. The fox had two more ducks when I was away. This has meant a frenzy of activity in the garden. We are trying to make the fox wary. The ducks have stopped their Late Night Party activities and are being sensible ducks. They are now going to bed before the hens. Amazing. 2 ducks are now sitting on nests. Unfortunately not in the duck houses...they have chosen spots close to the house where their scent should be confused with dog and people. I am hopeful. It all depends if they are good sitters or not. The one who has been sitting the longest has a good track record. But will she outwit the fox? It would be good to get yellow ducklings as all of our white ducks have now been fox food. The other plus side is the garden is looking much tidier. I have also been thinking about my next Viking. I think I know what I want to write. I am beginning to get a handle on the motiviations and theme. Always good. 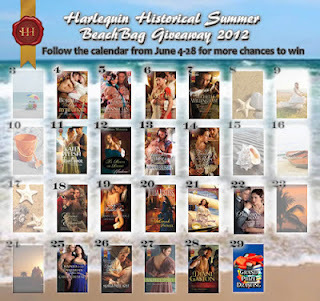 The Harlequin Historical Summer Beachbag giveaway continues. It is Terri Brisbin's day today. It totally went under my radar until now but Harlequin released The Gladiator's Honor as an ebook awhile ago. It is not available in the UK as an ebook, but in the US, it is. Anyway, it made me happy. You can get it from Barnes and Noble, Amazon, Harlequin.com or any ebook supplier. I am at the Pink Heart Society talking about Berlin (with more pictures) today. Here are a couple more photos that readers took. It was after the signing. I forgot to say that the lovely ladies from Realm on Our Bookshelves brought me a really sweet present -- a little delft figurine and some chocolate. The figurine now sits on the mantelpiece in my study. And another lady gave me a stuffed alligator or maybe it was a crocodile. Anyway, it was the people who made this conference and the readers had such big hearts. There was just such a great atmosphere that I am still in awe of it. I am planning on going next year and have asked if I can do a workshop -- maybe something to do with Vikings. Fingers crossed. However, reading about Katniss and Peeta is not getting my book written. I need to get it done so I can start the Viking on 1 July. I know the characters for the Viking btw. The hero is very determined about his name as is the heroine. Two strong willed characters are good in theory. In practice, the writing can get tough. But I am starting to play around with the theme. Dara Marks made some interesting observations and I think it makes sense to me now why Shackled went through with so few revisions. It has to do with getting the theme right and making the conflict wedded to the theme. But this one is going to be an experiment to see if I am right. 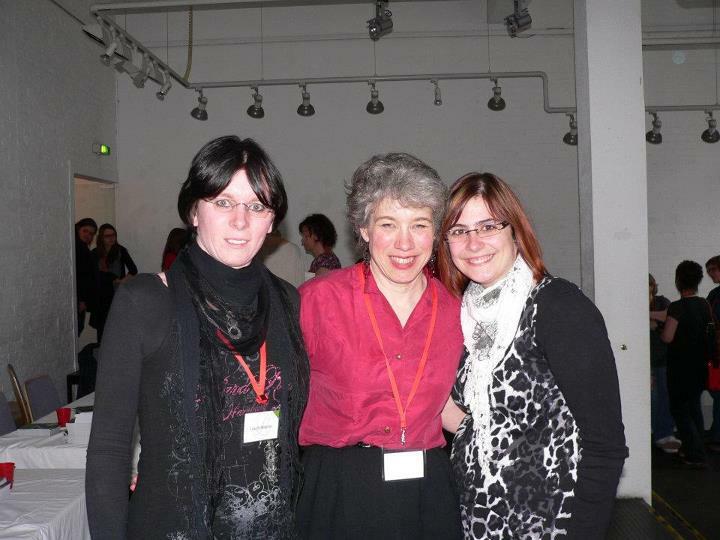 When I went to Berlin and the Loveletter magazin conference, I am not sure what I expected. What I hand not realised was how warm, generous and open hearted the mainly German readers were. It was crazy but oh so much fun. My experience started with a botched manicure. A trainee asked me in the departure lounge if I wanted one. I chose scarlet. It look beautiful. Unfortunately she told me her mother was a M&B fanatic and I dove into my bag for a book, forgetting I had wet nails. Smudging resulted. No time to repair. I tried to remove it. My nails were lightly stained scarlet for the rest of the journey. Spandau where the conference was held is lovely. It escaped bombing during WW2 and traces of the medieval city remain. My hotel was clean, functional and ideally placed -- right between the conference centre and where the gala dinner was held on Saturday night. I walked about on Friday evening, soaking in the atmosphere. At Saturday morning breakfast, I encountered a very lovely German translator. She does the translations for Sherry Thomas, Courtney Milan and a number of other historical authors. It was really interesting to hear how she tries to get the word play right etc. 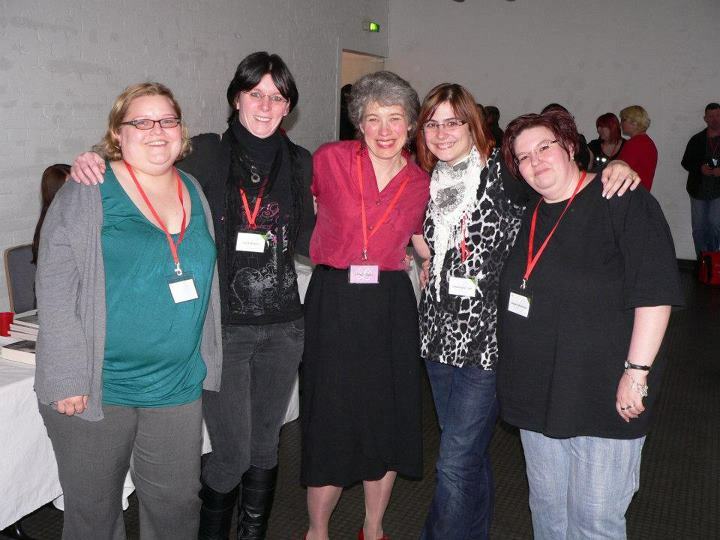 I then walked to the conference centre and encountered my friends from realms on Our Booksheleves. 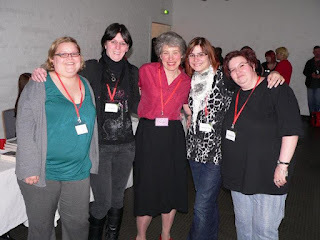 they have done reviews of my books in the past and I was so pleased to finally meet all of them in person. They are so much fun. After chatting with them, I went straight to work. First up a historical panel with Maya Banks and Lara Adrian. Sandy Schwab whom I've known online for years did the moderating as she speaks both German and English. We spoke about how we individually approach doing research. Both Maya and Lara only write medieval whereas I write in a number of time periods. The hall was packed. I also met a Cora editor (Bettina) whom I seen at breakfast who was very nice. Unfortunately Cora editorial director was ill and so was not at the conference. She was supposed to do the next panel with Maya, Nalini Singh and me on series romance. Luckily I have done enough talks on HMB for libraries that talking about series and the HMB history did not bother me. Bettina joined in from the audience and helped out. It was interesting to learn about the differences between some of the markets. Some things I already knew -- for example cowboys are not popular heroes in Europe. They are hugely popular in the US. Harlequin buys with a worldwide audience in mind and some books are more suitable to one market than another but there is always a broad range of books. After that it was time for my first blind date. I had worried about these beforehand but should have saved my energy. The women were so totally lovely. I passed out some of my books and we just chatted. Several were real Downton Abbey fans and are totally excited about the upcoming continuity from HMB. After that, it got crazy for awhile as people wanted me to sign their catalogues and kept coming up to talk to me about my shoes. Books and shoes were two recurring themes of my conference. I did a reading late in the day and again the small group was utterly charming. Dinner was at the Zitadelle Cellars. The food was fantastic and company divine. Sunday started with a panel on trends. I think the published authors were all of the same mind -- the only true trend is to write a story that engages the reader. If you hook thoroughly hook your reader and create a page turning read, you will find an audience. It is best to write with your heart. Again a blind date where I met some lovely ladies. Later I played a favourite German word game -- City, Country, River where I met more wonderful readers. My last duty was to sign books and my goodness did I sign. 140 books in little over an hour, plus bags, photographs, laminated covers including a cover of The Perfect Concubine. After it was all over, I walked back to the hotel with another author. I thought I'd call home and have a bit of a rest before supper. I spoke to my husband and son, put the phone down, closed my eyes and woke up at 2 am so no supper for me. The thing which will linger long in my memory is the warmth and friendliness of the attendees. It was just so inspiring to see all these women (and a few men!) who love romance books. I can't wait to go again next year. 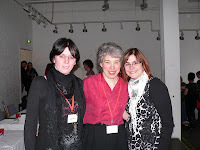 Kris Alice Hohls has promised another conference and I am so there. It was just a wonderful experience and I am so glad I went. It's vacation season and excitement mounts as that long-awaited time at the beach approaches. 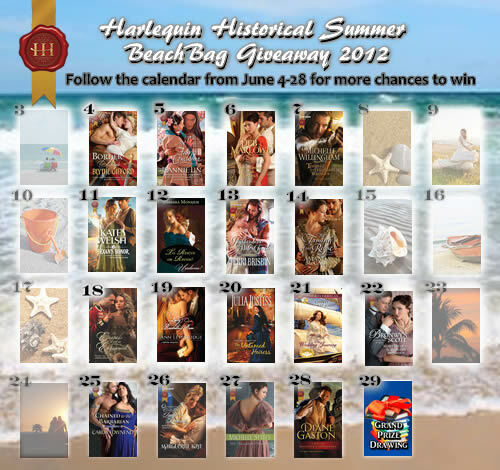 To add to your anticipation, some Harlequin Historical authors are offering a bevy of prizes to fill your beach bag with fun items (and BOOKS of course!) for that relaxation time. Each participating author will have an activity planned on their website for their special day. You may be asked to comment on a blog, do a scavenger hunt, or visit a Facebook page. For each day you participate, your name will be entered into the Grand Prize drawing.